10/23 UPDATE: JeffCo Clerk and Recorder Pam Anderson says it appears the two ballots were for two separate elections. Liberals and the media often are quick to dismiss the possibility of voter fraud, but Colorado’s new all-mail ballot system shows that there are gaps in the system. Over the weekend, Republican state House candidate Jon Keyser shared on Faceboook a photo of two ballots that he, personally, received for the 2013 election. See photo. The lack of ballot security in Colorado elections stems from a bill passed last legislative session, HB13-1303. The bill required that mail ballots be sent to all registered voters, regardless of whether they are active. This comes on the heels of a report that there were loose ballots abound at an apartment complex. Last week, the Denver Post reported that 7,000 received the wrong mail ballots. These are just the instances that are being reported. Who knows what other violations are out there? Keyser received 2 ballots as he was supposed to. Ha ha. CPP trying to start a scandal with last year's news…..losers. Do some homework before you post these stupid stories. From El Paso County last year – according to Wayne Williams' deputy! Can You Vote Twice If You Get Two Ballots? 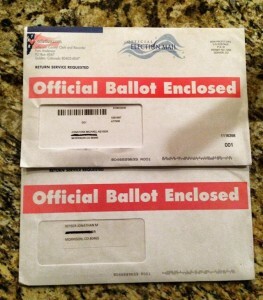 11 News had a viewer who got two election ballots in the mail. We asked El Paso County election officials if this is something they have seen before. They told us yes, that it happens every election. But they want voters to know they are prepared for it, and that no one will get two votes. Rebecca Johnston contacted 11 News after getting two ballots with her name on them in the mail. She got one Tuesday, then another Wednesday. She tells us she is concerned about voter fraud. “I was really surprised because I know this election is going to be so close and that there’s a possibility that people may vote twice,” said Johnston. Election officials tell us duplicate ballots happen to less than one percent of voters. “We put protections in place to not allow the ballot to be counted and that's the part that matters, is we don't count those ballots. We know they’re out there, we know they exist, we know it happens; the important part is the counting part,” said Alissa Vander Veen, Deputy Chief and Spokesperson for the El Paso County Clerk and Recorder’s Office. The ballot has to go through four steps before the vote is counted. "There’s no way it can get passed that first stage because there is no way it can go on to the next stage without clearing the first stage,” said Vander Veen. That’s because each ballot has a bar-code, and that bar-code is registered to a specific voter. Election officials say the computer system that scans the ballots is designed to make sure only one ballot is counted for each voter. Then the ballot has to go through signature verification, to make sure the signature on the ballot matches the signature in the voter’s registration system. It is a very complicated process. There are several steps and details along with this process and rules they have to follow, as well as what they do if they believe voter fraud is involved. But bottom line, if you get two ballots in the mail, call election officials at 575- VOTE (8683). They’ll have you read a number off the ballot and tell you which one to fill out and which ballot to shred. There could be endless minor reasons a voter is sent a new ballot. But it happens mostly when a change is made to their voter registration, specifically like a new name or address, or changes in mail-ballot applications. “The system is designed for that because we recognize that people they lose a ballot, or the post office doesn’t deliver it, so when they are requesting that other one, both may show up,” said Vander Veen. You can still apply for a mail-in ballot until Tuesday, October 30. For more information about that or election questions you can call officials at the number mentioned above or visit this link. If you would like to check to see if you mail-in ballot made it to the election office, click here. While walking in my neighborhood, I found a family's mail strewn across a couple yards. Included were two ballots. Someone must have maliciously opened the mailbox and threw their mail away. I picked it up and put it in their door. I blame these commies in the state house that call themselves dems.